But the former Sandygate ABC ace took two steps back when conceding considerable size and weight against Jamie Quinn on his second showing at King George’s Hall. The journeyman, with 80 losses on his resume, sprung the surprise of the night when out-pointing the Elite boxer after four rounds even though the conclusion carried some contention. Larkin, giving an astonishing 13lbs away to the ‘Devil Child’, was the tidier of the two fighters, his output was more refined and more economical. “I’m absolutely wounded but it is what it is,” said Larkin. “There’s no point dwelling and whinging about it. I should’ve put my foot down and refused to fight an opponent who weighed in a stone heavier. “I felt flat, tired and stressed. I just couldn’t get anything off because of his size. He was far too big. He was supposed to come in at 9st 8lbs, which is massive for me anyway. He ended up weighing in at 10st 2lbs and I was 9st 3lbs. “There was all those people out there. It was either fight him or don’t fight at all. I couldn’t go out there and let everybody down again after what happened before. Larkin attacked with greater volume, asserting himself behind his jab and switching to the torso with an invasion of hooks. However, Quinn soaked up the strikes. His favourable stature was starting to show as Larkin struggled to make an impression. 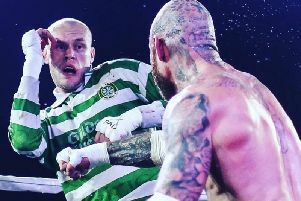 The Stockport-based boxer, who is naturally two weight classes above Larkin, responded with two heavy rights in to the rib cage in the second round and inflicted bruising around both of his opponent’s eyes. The former Park High School pupil said: “I could tell straight away. As soon as I hit him I knew it was going to be a tough four rounds. He hit me with a big body shot in the second round and I thought he’d broken my ribs. “I took some big shots from a welterweight, though, which shows I’ve got a chin made out of steel. He was massive in comparison. I’d overloaded on carbs and calories to propel my weight but I felt sluggish and I couldn’t hit as hard. I’m gutted. “I’ve been mixing with lads like Sean McGoldrick, Marc Leach and Ryan Doyle. This wasn’t supposed to happen. I wasn’t supposed to lose this early in my career. “I could tell straight away that I wasn’t at the level of my debut. I hit him with a few clean jabs in the first round and he didn’t even blink. It’s now back to the drawing board for Larkin, who will sit down with coach Alex Matvienko and manager Kevin Maree to discuss the next step. His next opportunity could come in June when Colne Muni opens its doors once again. “There aren’t many journeymen between 8st and 9st,” Larkin said. “They start coming in at featherweight. All the lads in my category are ambitious and have unbeaten records. They’re all coming to win so we might have to look abroad. “I’m faster and stronger at my natural weight. I hit harder. I was electric on my debut and let my combinations flow. Prospects don’t want to fight other prospects. They’re too bothered with protecting their unbeaten records. I’m a talented fighter and I was expected to go somewhere.